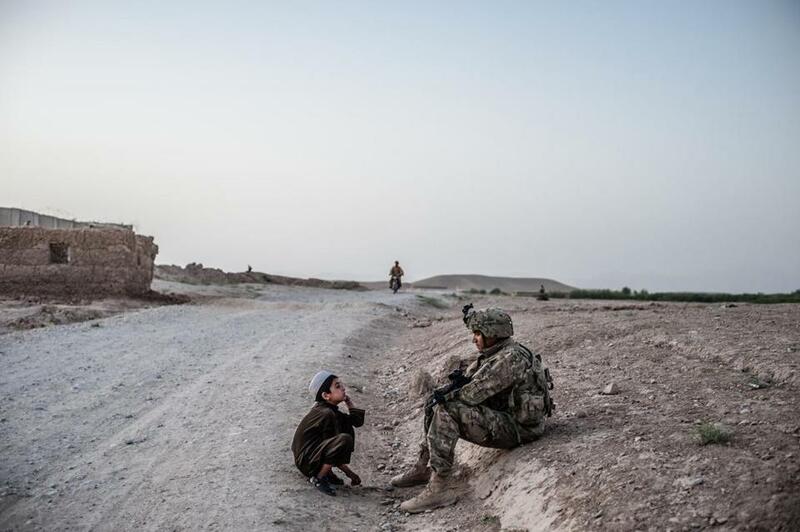 In “Zabul, 2011,” an Afghan boy and a US soldier in Qalat, the capital of Zabul Province. HARVARD — US forces are gradually leaving Afghanistan. The 22 unframed color photographs in Ben Brody’s “Afghanistan/Endgame” all relate in some way to the drawdown. “Drawdown” is less geopolitically impolite than “withdrawal” — in the same way that “escalation,” in Vietnam, four decades later became “surge,” in Iraq. A particularly striking Brody image shows flanking gouts of black smoke issuing from a cannon. The wall label is even more striking. Because the 70-pound shells the cannon fires are “heavy, dangerous, and inexpensive,” they’re being fired at an uninhabited hillside rather than shipped back to the United States. A comparable sense of futility, and absurdity, fills Brody’s photographs. The images are all the more powerful for their straightforwardness. Brody, a Southampton-based photojournalist whose work has appeared in venues including Army Times, USA Today, and GlobalPost, reports rather than editorializes. This means, of course, that the more scrupulous his reporting, the more pointed are viewers’ conclusions. 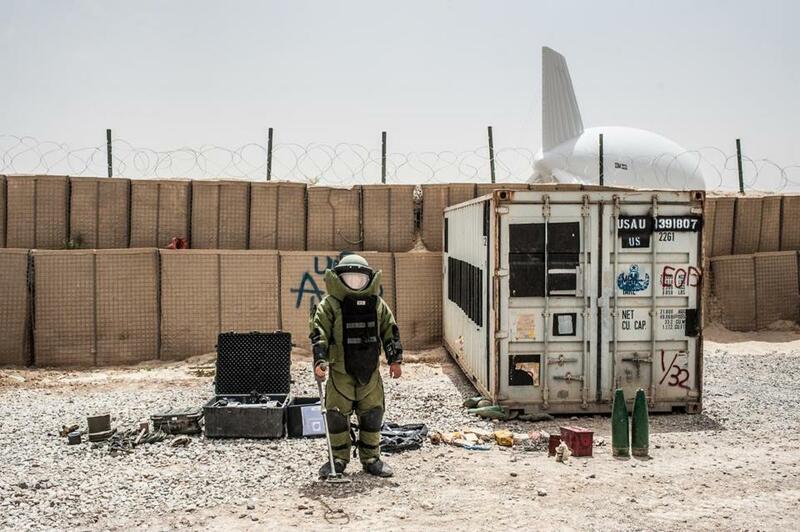 In "Kandahar, 2013," an Afghan soldier in a bomb disposal suit at Combat Outpost Ahmadkhan. An Afghan soldier in a bomb-disposal suit looks like the Michelin Man. This is eye-catching. Even more so is the fact that a grounded blimp is visible in the background. Suited man and tethered aircraft are visual kin. Brody is fond of such unsettling juxtapositions: farmland being tilled adjacent to Kandahar Airfield, a Fourth of July celebration at the airfield, a 9/11 mural at Bagram Airfield. Incongruity is as endemic to war as death is. Again and again, Brody has the acuity to find and document it — and great acuity not to dwell on it. Icongruity on a global scale defines the work of Edward Burtynsky. There are only 19 photographs in “Industrial Sublime,” but they cover a lot of ground. For more than three decades, he has gone to China, Saudi Arabia, Bangladesh, and the oil and mineral fields of his native Canada to record the depredations that industry and development have visited on nature. The incongruity comes in how often the devastation can be visually stunning. This is where the show’s title comes in. Sublimity is a very particular, and rare, kind of beauty. In the 18th century, Edmund Burke defined “terror” as “the ruling principle of the sublime.” Beauty and moral terror equally inform these images — whether of nickel tailings in Ontario, oil fields in California, granite quarries in Portugal, or even a bit of commercial strip at night in Pennsylvania. What Burtynsky presents isn’t anything as metaphorical as a warship firing into a continent or as concrete as a cannon firing into a hillside. His body of work shows a species firing into a planet. Also, unlike the hillside, the planet’s inhabited.